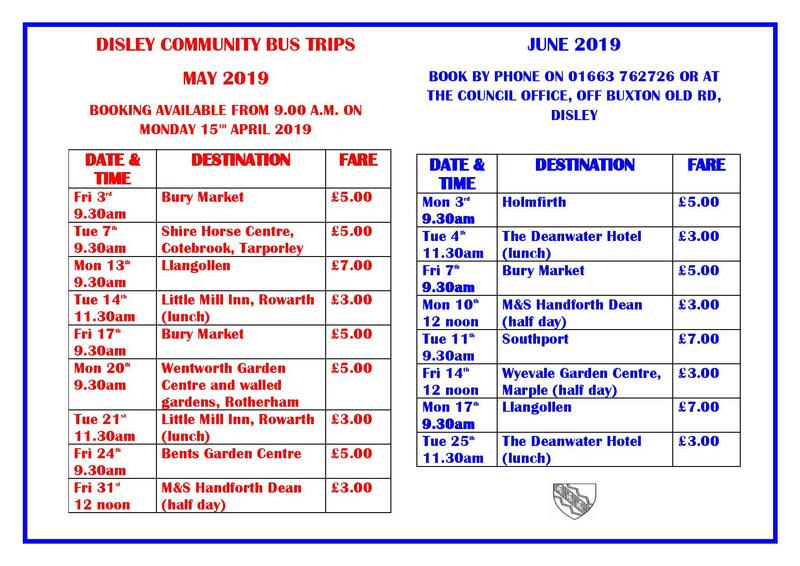 The Disley Community Bus Scheme is run by Disley Parish Council and operates as a not-for-profit community transport scheme. 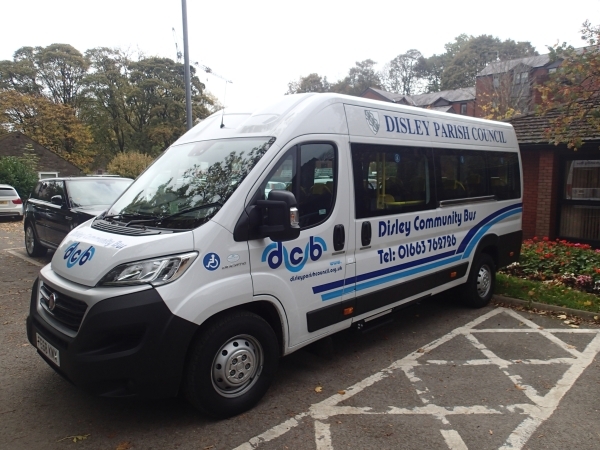 In 2018 a brand new 15-seater minibus was purchased with funding from Disley Parish Council, the National Lottery, Poynton Area Community Partnership, Disley & Newtown Good Neighbours, Cuppa an’ a Chat and many personal donations. The minibus is driven by a team of wonderful volunteer drivers who have all completed a minibus driving awareness course. The bus service offers excursions to places of interest outside the village such as historic venues, garden centres, markets and picturesque villages. Passengers must be registered as a member of the Community Bus Scheme. The membership fee is £1. Please download Membership Form below or call into the Parish Council Office. The Parish Council runs a regular weekly shop and ride service for those less mobile residents who would still like the independence of doing there own shopping. The shopper bus provides a door-to-door service to a local supermarket with a café and is available to users who can commit to going every week. The minibus is available to hire at competitive rates and local community groups can book it for a few hours or even a few days. Groups must be registered as a member of the Community Bus Scheme. The membership fee is £5. Please download a Group Membership form below or call into the Parish Council Office. Groups must provide their own drivers who need to register their details with us. A deposit may be required for bookings. The bus trips provide a real boost to many of our older residents and volunteer drivers are always needed to keep the scheme going. Full training is given, free of charge, and you could make a real difference in the community as well as getting out to some interesting locations. Register as a volunteer driver now: whatever time you can spare; enjoy free days out; help your community.